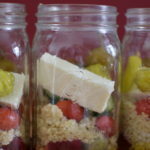 Not only are these salads easy to make but they are delicous and pretty too! 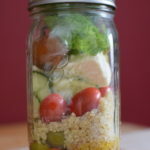 If you have worked with me teaching, you know about my salad jars. They are my go to lunch item…and I’m known for the pink color they turn because I love adding beets! I started making these beauties when I was pregnant and found them not only to be a time saver… but to be yummy too. I make them ahead of time on Sunday evening so I can grab one and go in the morning. They require little- to no effort- and are super simple to make. The hardest part is choosing what I want in them for the week. My favorite is Greek themed…however, I switch it up each week so they don’t get boring. 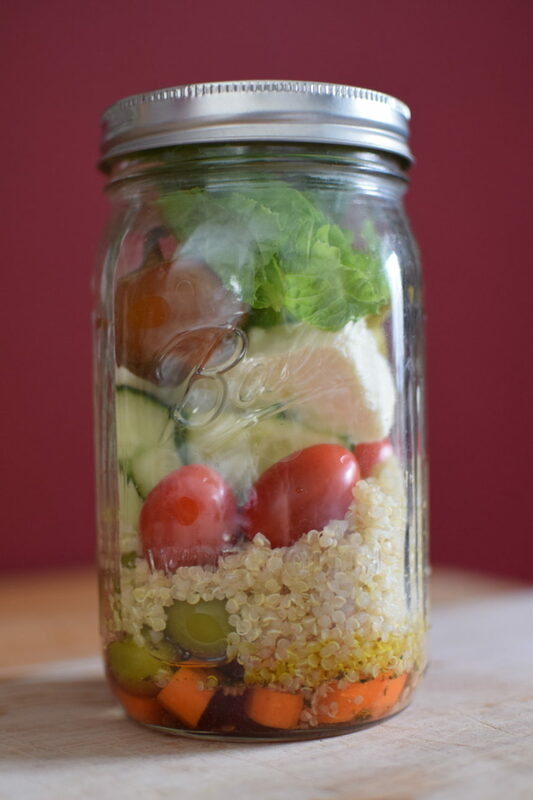 I am going to be documenting my Greek version…as GREEK SALADS ARE AMAZING. The method is the same for all my salads. Dressing goes in first…and when I say dressing, I mean oil & VINEGAR! I love any and all vinegars- balsamic, white wine, red wine, rice wine, flavors of all sorts. 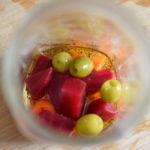 The best part of using just oil & VINEGAR (do you get the point that I use a lot of vinegar!?!) is that it is non intentionally healthy… as I control how much oil I use. 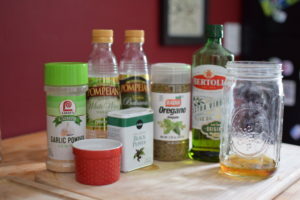 I use 2 (sometimes 3) tablespoons vinegar and one tablespoon oil. But it doesn’t matter- when you make them choose the dressing you prefer…and store bought is okay. 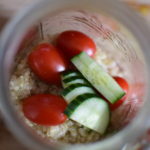 Next goes in the hard veggies or the ones I want to marinate -as these will sit in the dressing and soak up all week long……ooooh Friday’s salads are the yummiest! Afterwards goes my protein or starch. I change this up all the time…..sometimes its quinoa, sometimes its garbanzo beans, sometimes it’s potatoes, others….it’s rice. I have tried all sorts of additives. You really need this layer because this is the layer that fills you up…you know- keeps you going for the rest of the day. On top of this goes the items I don’t want marinating in the dressing all week. 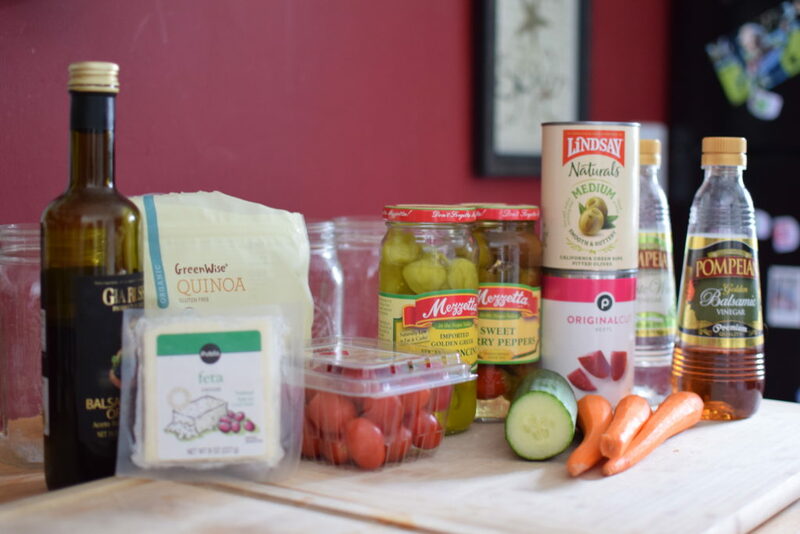 The cucumbers, tomatoes, cheese. Then to top it all off… in goes the greens. Then seal and store in fridge. 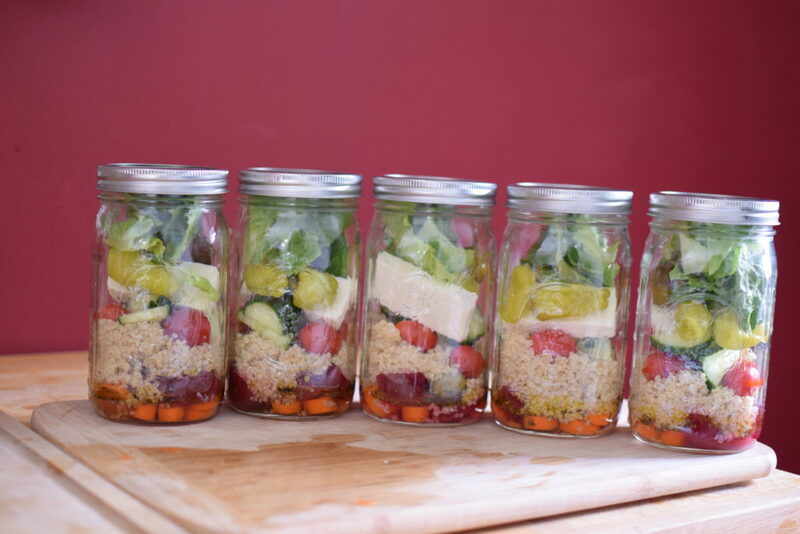 When I first started to make and enjoy these salads I would eat them directly out of the jar they are made. I would shake them up at lunch time to mix all the dressing and dig right in. However….I have gotten particular with my salads and I now keep a bowl at work that I dump my salad into and eat from there. I found by eating them right out of the jar I was forced to eat layer by layer as the jars are too narrow to dig for items at the bottom. But with dumping into bowl…..well I can take a bite of this and that and choose what and how I eat my salad. 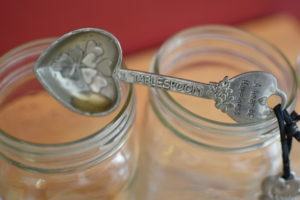 -Kristi…add a little Mercantile Style to your day!